Tablets, led by the iPad, have the potential to shake up the comic-book industry even more than ebook readers have begun to change the world of prose books. Large, portable color screens are perfect for reading comics. They’ve got a portability that desktop and laptop PCs can’t match, and of course they show off the source material in a way that small black-and-white Kindle screens can’t. The original iPad started the revolution, and the Retina display on both the third- and fourth-generation iPad provided dramatically improved image quality. Larger Android tablets such as Google’s Nexus 10 have also joined the party. And tablets running Windows 8 offer some distinct size advantages of their own. 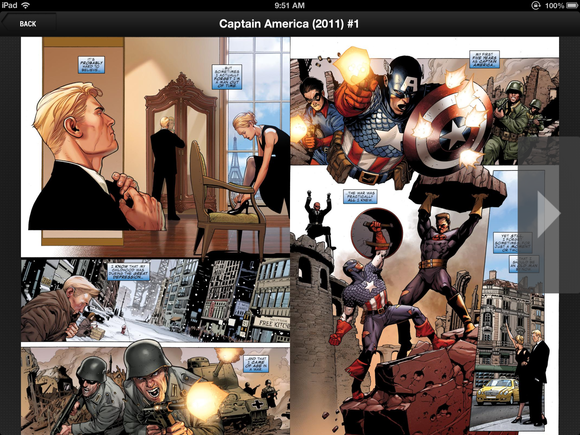 When the iPad was first released, I found it to be an excellent (albeit imperfect) comic-book reader. A few years of hardware and software iteration later, it’s a lot harder to spot imperfections. The only problem I have is that I’m now buying several comics a week on my iPad, with the credit card bill to prove it. There are a few different options when it comes to reading comics on the iPad or other tablets, and in some ways they parallel the choices that comic readers face in the printed comic market. Traditionally, comics were published monthly in small, flimsy issues. This is what my mom always called a “funnybook,” and it’s what I remember purchasing from a supermarket spinner rack as a kid. To this day, the major comics publishers still produce these issues—though they cost $3 or $4 now instead of the 25 cents I (okay, my mom) paid for my first comic. The best source for these single-issue comics is a company called Comixology, which makes an app called Comics for iOS, Windows 8, and Android. (You can also buy and read comics directly on its website.) Comixology is also the company behind the official Marvel and DC Comics apps, which are just relabeled versions of the Comics app. 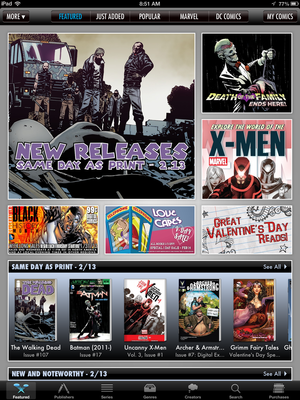 The Comics app (in all its forms) provides a storefront that’s inspired by iTunes and the App Store, with a showcase for featured comics, as well as lists of new and popular items. 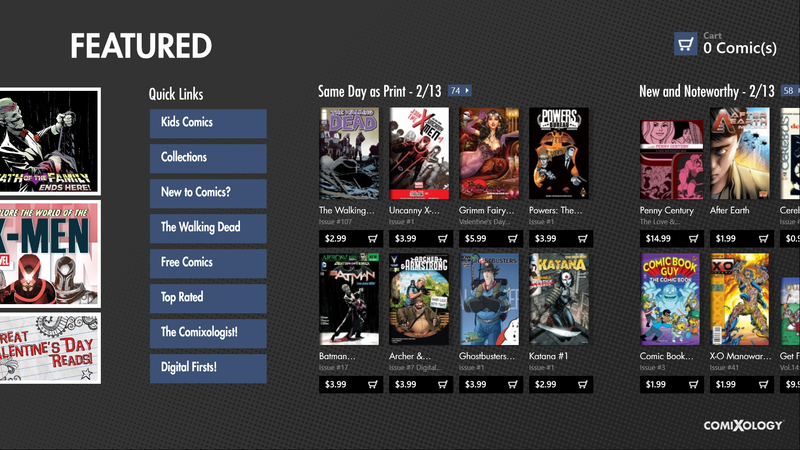 You can purchase a comic directly within the app, or read comics you’ve purchased separately via Comixology’s website. One of the best things about Comixology’s approach is that the company keeps track of all your purchases regardless of where you made them. If you buy them on the Web, you can read them on an iPad. If you buy them on a Nexus 10, you can read them on the Web. Just as your Amazon Kindle ebook purchases are available across any device with a Kindle app, all your Comixology purchases are available for download and re-download at any time from any device running the Comics app and viewable on the Web. 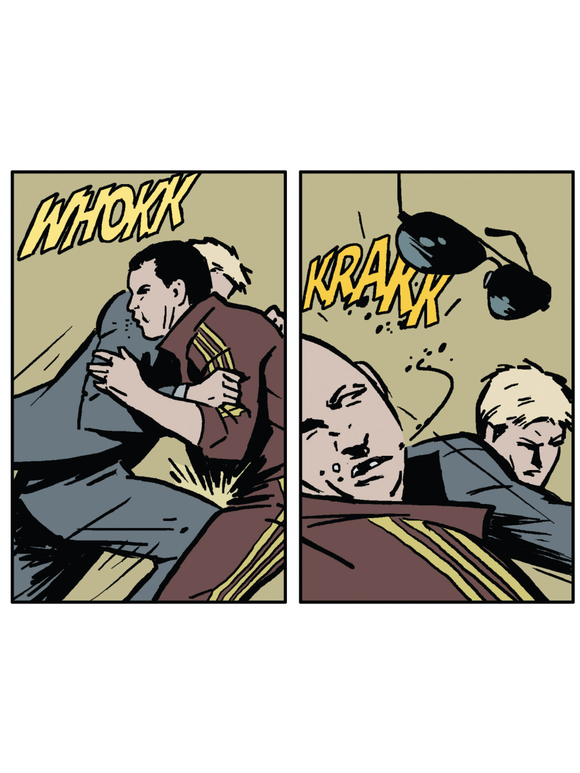 A full-resolution portion of a comic from a Retina iPad. Reading comics using the Comics app is pretty straightforward, as well. Once you open an issue, you can spread your fingers to zoom in and pinch to zoom out. Swiping to the left brings up the next page, and swiping right takes you back. In portrait orientation, the iPad’s screen is just big enough to make reading a pleasant experience. I equivocate here because some comics seem a bit too small when fit to the iPad’s screen size, while others don’t. It’s not much of a hardship to zoom in a little and pan around, but it’s nicer when you don’t have to. 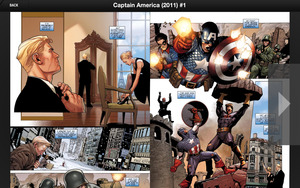 Comixology’s app also offers a guided view, which moves you through the comic panel by panel as you tap. This view is necessary on the iPhone as its screen is too small to comfortably view a full comic page. On the iPad, though, I found the feature superfluous. While Comixology has risen to become the industry’s dominant provider of digital comics, not everyone’s on board. If you’re a fan of Dark Horse Comics, you’ll need to use the Dark Horse app to buy and read comics. I’ve used the Dark Horse app to buy several issues of the Buffy Season 9 comic, and have experienced numerous download and purchase failures. The reading experience also fails to match up with the Comics app—it’s just not as smooth. But for now, that app is the only digital source for Dark Horse comics. 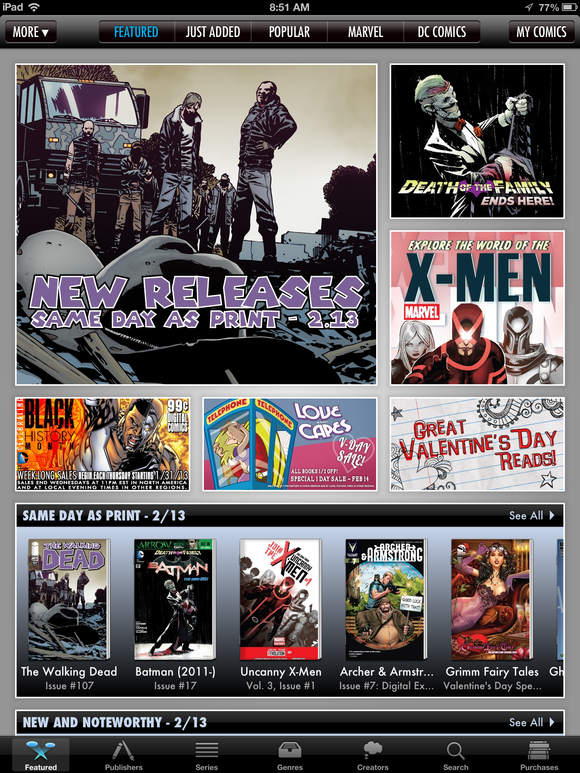 It’s nice to see publishers trying to reach casual comics readers via mainstream bookstores, but the reading experience is better in Comixology’s Comics app, which was purpose-built for reading comics. It’s easier to pan, zoom, and navigate through a comic using the Comics app than it is to use Kindle or iBooks apps, but the gap is narrowing. Marvel Unlimited lets you read older comics for one subscription price. Marvel Comics offers a unique approach to reading digital comics: A subscription service called Marvel Unlimited. Originally launched in 2007 on the desktop (and requiring Adobe Flash), it’s now an iOS app. For $10 per month or $60 for a year, Marvel Unlimited is like Netflix for (Marvel) comics. Like Netflix streaming, you won’t find hot new releases on Marvel Unlimited. But there’s unlimited access to more than 10,000 individual comics. If you just want to read through back issues of classic Marvel comics, and don’t really care about what’s happened in the past couple of years, it’s an interesting option. For the cost of 20 or so brand-new digital comics, you can mainline thousands classic Marvel comics for an entire year. It's worth serious consideration for dedicated Marvel Zombies. Even if the iPad is a nigh-perfect comic-reading device, and its comics apps are all perfectly good, the whole thing falls down if there are no comics to read. In the early days of digital comics, publishers were reluctant to release their digital issues at the same time they hit local comic-book stores. This artificial scarcity was an attempt to prop up the often-precarious businesses that still form the bulk of comic sales. However, in the past couple of years that dam has burst. Almost every major comic from Marvel, DC, and all the independents, is available digitally on the same day that its paper equivalent appears in comic book shops. On Wednesdays (the day new comics are usually released), I find myself scanning the “same day as print” section of the Comics app and buying way too many comics. If you, like me, are a comics fan from the era where Marvel and DC dominated so utterly that the indie comic scene was more of a curiosity, you will be delighted to discover that there are numerous independent comics that are made by the very best creators in the business, and most of those comics are available in one or more of these apps. I’m a big fan of Robert Kirkman’s teen-superhero series Invincible, Brian Clevinger’s Atomic Robo, and Joe Hill's Locke and Key. GoodReader does a decent job of displaying PDFs. If you've heard about CBR and CBZ files, it's most likely been in the context of pirated comics. Now, not all of the comics out there in CBR and CBZ format are pirated, just most of them. Still, if you happen to have some files in those formats—and I’ll admit to having loaded my iPad up with some comics that are stored in paper form in my house—there’s an answer for you, too. I’m pretty happy with bitolithic’s Comic Zeal, which handles CBRs and CBZs with aplomb. There are a bunch of other good ones, too. There are a few comics I own that are in PDF format. (Some of them I received as a Hugo Award voter, along with a passel of novels and stories in PDF as well; others came from Marvel’s DVD-ROM collection of Uncanny X-Men issues.) For these, I’m generally using GoodReader. 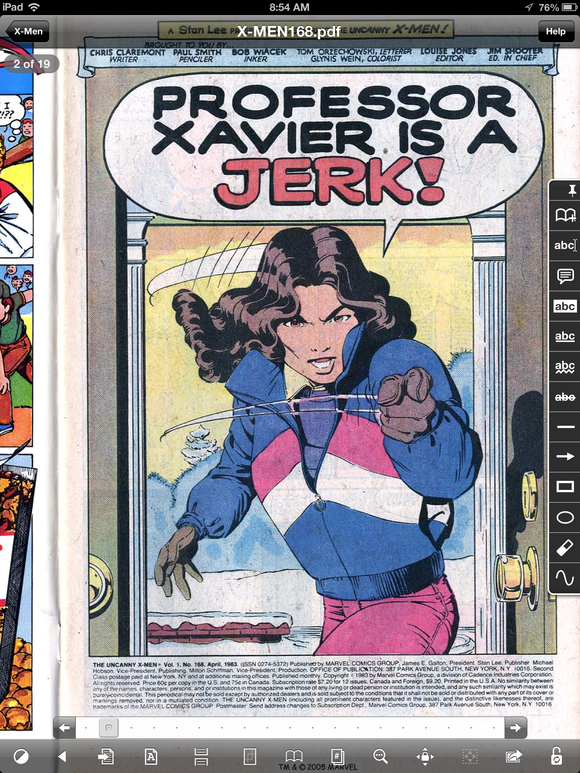 It’s a fine comic reader, and even Marvel’s unfortunate decision to save all of the X-Men issues as two-page spreads rather than single pages can be worked around with a little bit of pinching, zooming, and tapping. The original iPad debuted with a 9.7-inch screen, which is close to an ideal size for comics reading. (It’s still a tad too small, but it’s in the ballpark.) However, the intervening years have seen the release of numerous smaller tablets such as the Kindle Fire, Nexus 7, and iPad mini. Everyone will have their own take on the ideal device for reading comics. I also know people who read comics on their iPhones, a practice I dropped the day I got my first iPad. Personally, I find any device smaller than the iPad to be less than ideal for reading comics. I prefer to read comics page by page, more or less replicating the printed page of paper comics. (Maybe this makes me old school, but as long as comics creators are building pages in this shape, I think it’s only right that I read them as the creators intended.) Smaller screens require a lot of pinching and zooming, or reliance on Comixology’s Guided View to pan and zoom the panels. It beats not reading comics at all, I guess, but I wouldn’t choose it. Even now, when I’m using the iPad mini far more than the original full-sized iPad, I find myself digging out the iPad to read comics. Throw in the much higher resolution of the iPad’s Retina display, and it’s clear that bigger is better when it comes to reading digital comics. Though I haven’t spent more than a few minutes reading comics on a Windows 8 tablet, a friend who has used it tells me that it’s an even better experience than reading on the iPad. Bigger screens make a difference when it comes to reading comics. 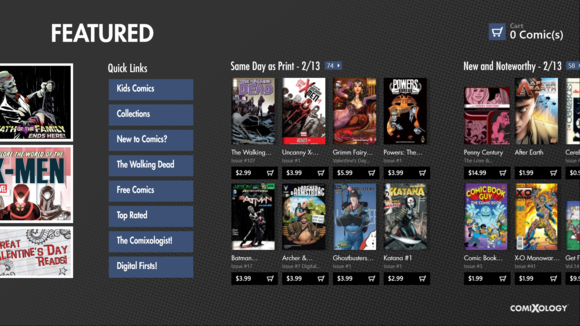 Comixology's Comics app on a Surface Pro. When I first wrote about the state of comics on the iPad in 2010, it was still early days. Since then, the industry has really gotten its act together and embraced the digital version. Most comics are available online the day they’re in stores, high-definition files display beautifully on high-resolution tablet displays, and even Marvel’s formerly Flash-only subscription service works on iPads now. What hasn’t changed is the fact that tablets like the iPad are truly excellent comic-reading devices. Now the comics I buy don’t take up space in my garage or in my carry-on bag. I’m buying comics regularly for the first time since I was a teenager, and my iPad is the reason why.